I had originally planned to start off talking about Edgeworth, but I ran into a rut and realized I had better start off with a more foundational topic: what response is this story trying to get from the audience? For instance, it took me two playthroughs to realize that it was silly to look for the same things in Dual Destinies that I saw in the earlier games by Takumi. Takumi is trying to give his players sudden bursts of clear insight, and accentuates them by playing them against the slow building of tension and accumulation of small details so the players gradually form an idea of who these characters are. By contrast, Yamazaki is trying to give his players the adrenaline rush of turnabouts and radical context changes at a pace more rapid than Takumi ever dreamed off but without Takumi's clarity. His characters are mainly to get surface level emotional reactions, and you can "figure out" characters fast. This game is in a similar position. It's certainly not telling a traditional Ace Attorney story about hidden incidents from the past, characters presenting false images, or trying to help a person in a very rough part of their life. So what kind of story is it trying to tell? It's a romance, but can we be more specific about what the story is going for? This game largely has a vignette structure. An entire year passes during the game, and we can often see that time is passing through Nina and Justin advancing through their training. Even when we can't, the events of one chapter usually are broken from those of the previous chapter. In Chapter 4, the characters are preparing to start taking actual trials. By Chapter 5, Nina is already perfectly comfortable accumulating evidence for court. Chapter 6 has them doing interrogations. Chapter 7 has Nina fetching files from document storage. Chapter 8 opens with Edgeworth reminiscing. There are only two cases where a story spans past one chapter. The first story spans three chapters and is the story of the broken samurai doll and Edgeworth's apology. The second story spans chapters eight through eleven and is Nina dealing with the possibility of not being able to solve her brother's murder, the misunderstanding between her and Edgeworth, the resultant near breakdown of communications between them, and Edgeworth consoling Nina when he learns what her behavior has been about. This is in stark contrast to the Ace Attorney structure we're used to, where a case is closed within four days, and the context for all our interactions with the characters for those four days is about solving that murder. Those aside, the individual vignettes don't have a clear "problem" to resolve by the chapter's end. If you wanted to look for a "problem," Chapter 4 gives us why Nina chose to go home, how Nina will react now that she knows about the pressue she put on Edgeworth to attend the Gavinners concert, what will come of Edgeworth being worried about Nina, Edgeworth's confusion and awkwardness over Klavier's popularity... Although general themes are continued, these "problems" are not. These are only loosely coupled vignettes. Even the chapter-spanning stories like Nina and her brother only recur once the story is done to give depth to a scene where Edgeworth holds her hand like her brother did, and Edgeworth looking into her brother's murder as a present for her graduation. The consequence is that these stories defy organization. You can't group them by time meaningfully. You can't group them as part of a story with its own structure, where events follow in unambiguous sequence with tight cause and effect. You can't even say that each vignette is like a single "move" in one of Edgeworth's chess games, where individual stories can be abandoned like pawns in the interest of well-defined moves forward in a grander, more abstract "game." The best you can do is say the three chapters about the Samurai doll belong together, and the four chapters about Nina's backstory with her brother belong together. This, I think, is why the game felt so daydreamlike to me. It's not a bad thing for these stories to defy organization if they're not supposed to be "organized" in the first place, instead opting for the ethereal, dreamlike quality. This also makes sense of why plotlines that could be milked for more drama are passed up. Besides the obvious point with Nina, there is the threat of Justin losing his badge in a sexual harassment case was passed up. It is not supposed to be that kind of story. The scene with Justin is supposed to build the image of Edgeworth as both a prodigy among prosecutors and someone who genuinely does care for his students. Making much drama of it would ruin the dream. Given this daydream quality, I think it's safe to assume that "digging into details" is not the way for me to evaluate this story. It's far better to evaluate how individual chapters deepen the daydream character of the story and contribute to our image of the various characters, chiefly Edgeworth and Nina. For romantic chemistry, it seems early to ask for something very specific there. The game gives us the sense that they are slowly, subconsciously (completely unconsciously in Edgeworth's case) falling for each other. For the first part of the story, I think that's enough for now! I'll need to look carefully at the two vignettes where Nina gets on Edgeworth's bad side to see how those contribute to the overall story, but I suspect the key things there are going to be the sides of Edgeworth and Nina those stories let us see that we can't see otherwise, a bit of tension to prevent the daydream structure from getting monotonous, and to show the resilience of the relationship that is slowly forming. As of right now, that is my outlook for the rest of this review. The next thing I should be writing about is Edgeworth's character. Regarding the review, I don't have many comments for now and I agree with how you're analysing the story so far. Especially what I find interesting, is how you speak about this dreamlike quality. The genre of self-insert is, of course, meant to appeal to fantasy and a dreamworld if you will, and this genre in Japanese is even called a "dream novel", so that's exactly the feel it's going for. I'm looking forward to the rest! The holidays meant progress was slower on my end than I'd like. Let's get things back up to speed. Prologue - This establishes that Edgeworth has high expectations but not much else. Most chapters establish this, so I won't mention it again. Chapter 2 - Edgeworth is dismissive of Gumshoe and frequently insults him in inner monologue. He is annoyed at Gumshoe's late report even after Gumshoe tells him the theft was only discovered that day. Edgeworth is indignant at the damage to his doll. He admits to being "unreasonable" and says he is "no good at this type of thing" about apologizing to Nina. Chapter 3 - Indirectly, we hear of Edgeworth not letting Franziska in his office for a month due to the doll. Edgeworth scoffs at Klavier's invitation to the bar. Even though he went to apologize, the conversation starts with awkward silence that Nina breaks. Edgeworth then interrupts her to blurt out "I'm sorry!" without explanation. He uses legal terminology to describe the apology. He ends with, "I regret it, and it was foolish of me. I'm really sorry. " Chapter 4 - Edgeworth still has contempt for Klavier. He relents and goes to the concert after Nina's accidental guilt-tripping, but it's a nice touch that we never see him agreeing to it. Edgeworth is uncomfortable all throughout the concert and leaves early when Klavier draws attention to him. I discuss the end of this chapter in greater detail later. Chapter 5 - We see Edgeworth do a great deal of preparatory work for Nina's trial. During the earthquake, he orders Nina on protecting herself. Beyond that, he's short on words due to being shaken up. (Pun absolutely intended.) He's still short with Gumshoe, but he seems to recover fairly quickly. He doesn't cut Gumshoe off quite soon enough, though, which I attribute to him still being bothered by the earthquake. He tries to hide this vulnerability of his. The conversation with Gumshoe showcases previous traits we've see of his and hints toward Edgeworth's past, which the audience knows, but Nina does not. This conversation is chiefly used to spark Nina's interest in Edgeworth. Chapter 6 - Edgeworth keeps surprisingly calm while Justin is with the P.I.C. He directs Nina to focus on the reading while Justin is there, and when Edgeworth himself goes to the P.I.C., he instructs both of them to stop looking so worried. I interpret this as Edgeworth trying to ease Nina's tension by distraction. We then see Edgeworth exhausted, and having saved Justin's job, Nina remarks that he truly is a genius prosecutor. Chapter 7 - The gossiping girls call Edgeworth unapproachable, and then we hear Edgeworth laughing in Franziska's presence. He and Franziska are talking about something, I think the end of 2-2?, but there isn't enough context for me to say more. The scene changes, and we see Edgeworth is avoiding Oldbag's stalking. We also see Edgeworth completely oblivious to Office Worker asking Edgeworth out to dinner. Chapters 8-11 will require a separate post. Chapter 12 - Edgeworth remarks that he likes "the usual Lawson" over the Lawson that appears dressed for the matchmaking party, comically missing the point. His thoughts start "ambling," and he decides to go home, only to encounter Nina/the Proto Badger. This was a good chapter for Edgeworth! His two reactions to Nina's blue dress were a nice change of pace from the previous chapters, and the romantic chemistry here is believable. Chapter 13 - Edgeworth physically exerts himself to prevent Nina from missing curfew. He's irritated, but his anger is softened compared to the earlier chapters, which is a nice touch. This chapter is more tailored towards Nina than Edgeworth. ...Also, what is meant by residential training? Chapter 14 - The most "special" thing we see is Edgeworth give Nina his own analysis of her brother's murder case. Nina emphasizes the time this would take of him. Edgeworth is also much warmer with Nina, smiling at the thought of going to that restaurant again. Where Nina unambiguously emphasizes going with Edgeworth, Edgeworth says (maybe playfully?) that she must like the food. Good breaking point! The main barrier to my making up my mind about this Edgeworth is Chapters 8-11. * The writing seems to be playing up childish pettiness from Edgeworth, between his reaction to the Steel Samurai doll, his interactions with Gumshoe, his reaction to finding Diego and Nina, and his failure to manage that reaction. I'm leaning towards liking this decision. * At the end of chapter 4, Edgeworth comes off as out of character. While Edgeworth is unfamiliar with talking about romantic attraction, he fumbles with his words more than I'd expect. 1. He calls falling for Klavier "not... logical." I don't know what that means. Is Edgeworth saying that Klavier is unpleasant due to how conversations with him do not take the form of logical propositions? Is Edgeworth saying that the perceived advantages of associating with Klavier disappear upon scrutiny? Is he simply saying that he sees no reason anybody would ever be interested in him, even at first sight? Edgeworth has disliked Klavier for long enough now that Edgeworth should have a clearer answer, and if he has it, he should express it. 2. Edgeworth's "Girls... that is... I mean... women... " is a very awkward line! 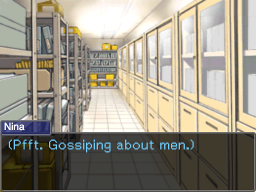 I can understand Edgeworth second-guessing if it's better to use "girls" or "women" here, but it might be too strong. 3. The pause and air-quotes in Edgeworth's "Do they like men who are laidback and... “fun-loving”?" shows again that he can't find the word, and his ignoring that "everyone has different preferences" is quite the blunder. I understand that the awkwardness is intentional, but especially at this early stage, it's too awkward for me to believe Edgeworth would say this. Edgeworth devising an excuse to check on Nina while denying his interest in knowing what she's doing already indicates strong feelings he's denying. Adding that to the awkward taxi conversation just deepens the overkill. Another long one! I'll do a post about Nina, and by that time, I'll have some questions about Chapters 8-11 in preparation for the (then) next post about their dynamic. I had been struggling to write about Nina. We spend a lot of time with her, and yet there's an unidentifiable quality about her that prevented me from putting my thoughts together. It finally hit me a week ago. I cannot recall seeing a more reserved protagonist on this site, or a character who was more reserved without being over-the-top. The two main ways that we see her character are inner monologue and her reactions to people around her. Barring the stories of the Steel Samurai Doll and the Meeting With Diego, she doesn't initiate much action that the rest of the cast reacts to. Contrast this with Justin Swift. Justin Swift tells a joke - however bad - about Nina being lovesick. He is the one to prompt Edgeworth to comment on Nina's dress. When he and Nina talk, he is usually the one to initiate it; he is the one to find her in the prologue, he is the one to start talking about what he didn't understand from Edgeworth's lecture, he calls her back after she's distracted by the conversation between Gumshoe and Kay. Nina may be the protagonist, but I cannot think of any similar actions she takes in the story, again excluding those two conflict scenes. This isn't bad, but it is a different style of judging character than I'm used to. Inner monologue is crucial, and significant speech and action are especially significant by virtue of their rarity. With that insight, I'll be going through all the chapters again and summarizing what I learn about Nina's character from each. Again, Chapters 8-11 are excluded from this post because those need special treatment. Because Nina is an original character, I'll be writing my thoughts stream-of-consciousness-style, for sake of making clear when I come to the conclusions I do about her character. Prologue - Having already played the game, I recognize why Nina really wants to work with Diego. The chapter subtly raises a question about why Nina decided to become a prosecutor, but the chapter mainly introduces us to our cast. Chapter 1 - Combined with some miscellaneous details from the prologue, I'm confident saying she is observant but excitable, but knowing when to rein herself it. I'm not quite ready to interpret Nina appreciating the extra time from Edgeworth, rather than complaining about the difficulty of the course, or the line about Nina leaving "before he hurts my feelings even more". Does she resent Edgeworth for this...? Chapter 2 - This is mainly an Edgeworth chapter. Chapter 3 - I get the sense that Nina is taking the peculiarities of Edgeworth's teaching, the large assignments and late lunch breaks, in stride, though further details escape me. I also like the choice to make Nina the type of person who is inner monologuing about the people around her. It gives Nina a voice when her reserve means she wouldn't have much of a one otherwise, and it gets in characterization that it would be hard to show without damaging the pacing. It also works well for her as a lawyer. Her tendency to ignore others (even Klavier mid-discussion!) when inner monologuing is a nice touch which makes Nina more believable. Looking over the script, the examine conversations show off Nina's goofier side more. I'm starting to wish I had clicked those more on my initial playthroughs. Chapter 4 - Nina's awkwardness at being in the spotlight makes me a bit more confident in my "reserved Nina" view. The most interesting development with Nina continues from something last chapter, how quick she was to apologize to Edgeworth, having realized how attached Edgeworth was to that doll and being convinced by Edgeworth's earlier logic that she must have accidentally broken it. Nina is incredibly introspective. Here, she's quick to realize that Edgeworth actually is not enjoying the concert, and that he came only due to her (accidental) guilt trip, which she feels guilty over. Meanwhile, Edgeworth still treats unease and uncertainty as unnecessary feelings. He makes a stray comment about possibly feeling possessive, but his only follow-up is to say that is unlike him. Edgeworth's introspection stops short when he may not like the results. I really like this contrast! Chapter 5 - Nina is chiefly a narrator here. We continue to see her excitability, and she recognizes her "oddly nervous" feeling far sooner than Edgeworth realized his distraction. When Gumshoe says Edgeworth is "pretty nice deep down," Nina asks herself "how deep" that would have to be. Perhaps you should clarify that line? Based on Chapter One, Nina does appreciate the time Edgeworth gives her, which was emphasized just at the start of this chapter by Edgewoth's trial preparation before the earthquake hit. I like the dynamic between her and Gumshoe. If you're going to play up Gumshoe's financial situation, sympathy is necessary. Out of curiosity, did Larry appear here in the original work? Chapter 6 - It's a nice touch that Nina notices Justin's phone going off before he does. The day ends with Nina in awe of Edgeworth's ability to have handled the P.I.C. troubles already. Chapter 7 - Continuing from Chapter 5, Nina learns that there is a lot more to the seemingly inhuman Edgeworth than she first thought. Nina continues to be a very good narrator of the scenes. Her talking with Franziska suggests, but the talk with the gossiping girl cements, that she is not one to say "no" to others. In hindsight, this also makes sense of her accepting her status as the one to fetch the heavy law book back in Chapter 1. It's ambiguous if Nina is aware of her crush on Edgeworth, but it's becoming harder and harder for her to miss. Chapters 8-11 are, again, skipped. Chapter 12 - Nina's personality is consistent when talking with Swift, but nothing special worth noting. I really like the decision not to go into Nina's inner monologue when Edgeworth opines about her dress. Chapter 13 - It's nice to see Nina interact with people other than those at the prosecutor's office! Nina's boredom at the party is probably due to her wanting to talk to Edgeworth, but I take it also as a detail supporting her reserve. It is a very nice details that she rebukes Franziska in a examine conversation, and that she's willing - although in inner monologue - to call Edgeworth gaudy, even though it's quite clear to her by now that she does have feelings for him. Chapter 14 - Swift needing to rein Nina in is quite a nice touch! A lot of what else I have to say here is about the romance between her and Edgeworth, which is a subject for a future part. I also really like that she has to push herself to tell Edgeworth that she's interested, albeit indirectly. I feel like I have less to say about Nina than I do about Edgeworth, which makes sense. I gather that Nina is, much like Phoenix, a character who the reader can easily insert themselves in as. And it works! Nina isn't bland, nor is she so well-defined that the reader-insert character of her character is lost. It's hard to analyze how it works, but in this case, it really does. I add that the case uses optional conversations to add a lot of color, especially to Nina. I somehow forgot to do this after the first talk with Justin, and now that I've read all those conversations, I like her a great deal more now. I also have to give credit for how well Nina works as a narrator. She gives us enough to feel like we're there, not too much that the pacing is ruined, and she's able to sneak bits and pieces of her own personality in the process. Which is doubly important as a way to get her character across, which is especially important given how little dialogue Nina has, which makes sense given that dialogue would damage her reader-insert qualities... The design is wonderfully cohesive, and I'm impressed. For Chapters 8-11, I keep coming back to a single question: do you think Edgeworth is being overly harsh? I understand how Nina and Edgeworth’s reactions are in-character, but in a situation like this, it’s unusual for a game to not imply that Edgeworth’s actions are amiss in a situation like this. The way I’m reading this scene, harsh is an understatement. It should have been clear by the time Nina rants at Edgeworth that Nina was upset, right? Also, if you were curious, my text editor says there are 2566 ellipses in your script. I think that's a record, for a case of this length. Thank you for continuing your review! I have been reading with interest and really appreciate the detail you are going into. Firstly, and briefly, residential training would just be training "away from home", as it were. In other words, they're training in a different location and staying at the hotel. We used to use the phrase "residential trip" in school to refer to a school trip where we stayed somewhere overnight. I don't know how common a phrase it is, though. Re: Chapter 4: I will wait for the completion of the review, but there may be some things scriptwise I could tweak here, without damaging the translation/adaptation. To be honest, I think it was one of my least favourite chapters, maybe for the reasons you point out. In relation to Edgeworth being overly harsh: Yes, I think he is to an extent. I think this partly stems from him not being able to come to terms with his own feelings/them amplifying due to jealously. Although the audience may be fairly sure there's nothing going on between Nina and Godot, Edgeworth is not used to feelings of jealousy like this and may pin them down to him just being frustrated that, in his eyes, Nina is playing around and not taking training seriously, which in some ways he could take as an insult to his profession, which he takes very seriously, as we know. (Married to his job is a good way to sum it up). But that, being mixed in with jealously, I think would amplify his reaction here. Please let me know if there's anything else you'd like me to clarify, and thank you again! That all makes sense to me! These were the chapters that made me rethink the structure of my review. I was re-playing the case starting at Ch. 8, my memory of the previous chapters being dull, and was appalled at how badly Edgeworth was treating Nina... I was going to write the part of the review about that when I reread the previous chapters and found that my perception was skewed. So, what do we actually have? While several scenes establish that Edgeworth is a demanding teacher, several scenes also establish that he really does care about his students. Nina observes herself in Chapter 1 that Edgeworth is giving his pupils a lot of his time, enough time to interfere with the rest of his duties as prosecutor. We see Edgeworth taking his own initiative in preparing documents for Nina's trial in Chapter 4. He uses his own political weight to help Justin keep his badge after the P.I.C. encroaches in Chapter 6. At the same time, Edgeworth's usual incisive analysis is blind to his own motivations. While it's clear from early on that Nina is "special" to Edgeworth, Edgeworth doesn't seem to recognize the pattern. On the opposite end, Nina displays self-knowledge and the ability to recognize and accept her mistakes. If anything, she's too quick to accept them. Case in point: accepting that she probably did break the Samurai, then figuring out that she guilt tripped Edgeworth into attending the concert. Th story is fine conveying these - it just took me a while to figure out how to approach this story "on its own terms." Again, dating simulators are not my genre. Chapter 8, Scene 1 reminds us that Edgeworth still does care about his students, but it goes further than the previous scenes. The other scenes haven't told us why Edgeworth is putting so much time into them. For all we knew, it could be out of obligation, just like he felt obligated to apologize to Nina after the "false accusation". But now Edgeworth says, "(I usually find having to take on students a bit of a nuisance. And yet, this year, I find myself rather enjoying it.)" He's even in such a good mood that he finds himself ambling! Chapter 8, Scene 2 has Edgeworth seeing Nina run, crying, from Godot. Edgeworth is perfectly in-character as he tries to work out the context for the scene and makes the valid deduction that the two are close. His mistake is assuming "close" means romantically involved. Edgeworth doesn't outright say it, but he assumes a tryst. The scene ends with Edgeworth saying that his normal methods of calming himself fail, and he has a feeling he can't identify, like anger. In-context, it's likely a mixture of betrayal, jealousy, resentment. Vielwerth's paragraph in their last post is about what I was thinking. Now, this other scene also establishes that Edgeworth doesn't quite recognize his motivations, in keeping with his character elsewhere. He puts the blame on Nina's lack of focus on her work, not even broaching why he feels as betrayed as he does. Chapter 8, Scene 3 is next. It raises some suspense as to what actually happened between the two while assuring us that the true explanation is not what Edgeworth says. I think this scene is the first where we see Nina completely silent before Edgeworth. Even with the Samurai doll, she was able to evaluate the likelihood that she really was responsible for breaking the doll. Here, all we get are ellipses from Nina as she takes the brunt of Edgeworth's rage. As Nina observes, "I'm not the only one shaking. Everyone else looks terrified, too..." Presumably, this includes Justin, who should have a good idea of where normal is for Edgeworth. Edgeworth adds one last jab telling her not to be "gallivanting about late at night." Lastly, Scene 4. That exchange bothers Nina throughout the rest of the day, and it's telling that she says, "I feel like there's been something wrong with me lately. I just haven't been able to keep calm and I feel like I'm just going around in circles." She puts the responsibility on herself, which, again, is perfectly in-character. Diego has an accurate guess as to Edgeworth's motives, but when he hints at this to her, Nina again blames herself for not doing the assignment. This is all consistent with their previous character, and organic rather than contrived. Chapter 9, Scene 1 next. We learn that tensions between Nina and Edgeworth remain high, which is really all the context we need. Nina blunders on some questions, and Edgeworth lectures her. At first, it looks like it'll be a rehash of Chapter 8, Scene 3, but then Edgeworth pushes a nerve. I'll quote this exchange in full. Are you sure you really want to become a prosecutor? Because I’m finding it incredibly hard to believe. Are you sure you haven’t just chosen this profession on some flight-of-fancy? I don’t think even you have the right to say something like that! I’ve worked so hard for so long so that I could become a prosecutor! ...No, other people’s feelings at all! You don’t care, even if you hurt them! Go home for the day. Another thing that I completely missed on my first couple of reads is, in hindsight, glaringly obvious. Because Nina is the most reserved protagonist I've seen, it is astounding that she returns Edgeworth's criticism, and all in dialogue, no inner monologue! Edgeworth's response is an implied but direct claim of authority, commanding Nina to go home. Nina contests, but in the end, acquiesces. Somebody like her isn't going to become perfectly resolute, especially when Nina has been previously assuming something is wrong with her! This dialogue works! Scene 2 shows Nina's reaction to the fallout, an exchange with the office worker (Lady) with a crush on Edgeworth. This exchange has the key function of breaking Nina out of her rage. She complains to Lady. Lady, not knowing the context, appears to assume this is just the regular course of business and says she envies how much closer Nina can be to Edgeworth. This triggers some reflections from Nina that I'll admit I don't quite understand. My best guess is that furious though she is, she takes this as an unambiguous sign that her growing crush will not be returned. Thinking of that takes her mind off of her anger towards Edgeworth and back to Nina's usual introspection. The way Edgeworth first frames the situation, his fault is that he is too logical for an emotional woman like Nina. But he then admits that his anger was out of control, and he couldn't listen. This is interspersed with calling Nina's outburst cruel. My original reading of the scene was that the author was defending Edgeworth's behavior. (See first paragraph of this part of the review.) I think I was too hasty there. While Edgeworth is treating Nina badly, the game isn't defending it. This is just how the characters would react, given Edgeworth's tendencies to self-righteousness and just how reserved Nina is. Edgeworth admitting his anger and Nina displaying hers are cracks (with hopefully more to come!) in those respective flaws. I'll add that a friend of a friend says Edgeworth has sexist tendencies in the Japanese version, so this writing may just be echoing that. This is a very Nina response. She ignores that Edgeworth should have seen that something besides "gallivanting late at night" was troubling Nina and tried to help her through it, rather than setting Nina up for an angry outburst. But there's something to her evaluating of herself, and I can absolutely believe this is the conclusion she'd come to. I have to commend the original author and you on how natural this all feels! There are many, many ways to reveal backstory like this that would be awkward or laughable. By making the conflict take center stage with the backstory taking a critical supporting role, it works. And it helps the romantic chemistry that the two go through a rough patch. Alright, and now for the reconciliation in Chapter 11. The reader knows Edgeworth isn't going to remove Nina, so the opening scene where Nina learns that trainees can be removed seems to be chiefly set-up for her talking to Edgeworth. Nina's apology is simple, but it works. It's good to see Nina speaking this, but we've already seen her think this just last chapter, so the real key scene here is Edgeworth talking with Nina. This is the only scene in the entire story that still feels "off" to me. Unfortunately, I don't think there's much that can be done here without changing things from the translation. The first thing is that, "As long as you don't give up, you will be able to reach the truth in the end" is a jarringly sentimental line for Edgeworth. With his experience, he has to know that not every case will be closed. DL-6 would have gone unsolved if not for von Karma choosing to execute his revenge plot. If this is a literal translation of the original, there isn't much that can be done here. If you're more flexible, then perhaps, "It's too early to give up, until you've traced down every possible lead. Something unexpected might reveal the truth." The other point may just be me: I think Edgeworth gets off too easily in his talk with Nina, and the development feels one-sided to me as a result. I think it would have been better for Edgeworth to admit some fault here, perhaps admitting that he was premature in concluding why her focus was slipping. Edgeworth's dialogue also comes off as more natural than I'd expect for your interpretation of Edgeworth, given his professed difficulties with "emotional" conversation, even if he has gone through something similar. Though I understand that as a translator, this may be beyond what you can change. Okay, that scene is down! I think I'll do one more part before giving a Check I verdict. This will be on the romantic chemistry between our two leads. So with those chapters finally tamed, let's begin the final part of the "core" review. Starting with something that is long overdue! As if they don't already know the best catch is Winston Payne. Now that I have the characters down, let's talk about the romance in this dating simulator. The section I've been asked to QA ends with Nina asking Edgeworth out to dinner, but maybe it's a date or maybe this is just the first "come closer" signal from Edgeworth before Nina even thinks about asking Edgeworth for a date... Either way, the romance starts slow, and most of the romantic chemistry we see are these feelings appearing and taking root. I missed this on my first few reads, but Edgeworth is the first to demonstrate interest. During the first three chapters, Nina is eager to please her mentor, but that eagerness does not goes beyond what you'd expect of a nervous trainee. She thanks Edgeworth for apologizing, but that's because she has an idea of how deeply the loss must be affecting Edgeworth. Edgeworth, on the other hand, says there's something indefinably different about Nina in this chapter. In Chapter 4, again, Nina doesn't display any signs of attraction to Edgeworth, but Edgeworth is interested in her! That parting smile and phone call from his office may not have made his intentions clear, but combined with, "Girls... that is... I mean... women...", I have no doubt. It makes sense that Edgeworth is interested first! During this early stage of training, Nina would be focusing on keeping up with Edgeworth's lessons. The second half of Chapter 5, set over a month since Chapter 4, is when we get a first weak hint that his feelings may be reciprocated. After Gumshoe's cryptic comments, Nina remarks that she wants to know who Edgeworth is really. Up to this point, Nina has been thinking of Edgeworth as a boss who is generous with his time but is perennially critical and easily annoyed. This opinion starts to change in Chapter 6, when he sees Edgeworth save Justin's career from an otherwise certain end. In Chapter 7, Nina overhears the gossip about Edgeworth being unapproachable, and this day of all days, she overhears Edgeworth laughing and sees a break in his otherwise stern demeanor. Nina makes a comment about, "W-we don't hold hands!" unthinkingly, and Edgeworth blushes, indicating the subject may be more on both their minds than they realize. Nina's hands start trembling, and she remarks that she might not know him after all. Nina sees Edgeworth not realize the office worker is asking him out, and laments that she isn't getting closer to him. Lastly, she has a conversation with the gossiping girl where she blushes at the mention of Edgeworth, and Nina is forced to admit that Edgeworth is probably "unobtainable" due to that lack of interest. By this point, Nina has to recognize her interest in him, even though she doesn't think it could lead anywhere. Now that I focus on their romantic chemistry, it was a better decision to have Chapter 8 here than I first gave you and the original author credit for. Chapter 7 established that although Edgeworth does have a side to him where a romance might work, it isn't one that Edgeworth is likely to reveal without some heavy prodding. The conflict of Chapters 8-9 and the resolution of Chapters 10-11 were that heavy prodding. How else could Edgeworth taking Nina out for dinner work?! I've discussed these chapters at length already, so I'll content myself to say that Edgeworth's envy at Godot for (supposedly) having Nina is unmistakeable, and Nina is oblivious to Edgeworth's interest in her. And realizing that, Chapter 12 works even better than I thought. It simultaneously injects some comedy after the tumult of the previous chapters, establishes that now Nina knows a relationship with Edgeworth is plausible, and establishes that such a thing is going to be difficult because of Edgeworth being Edgeworth, and it'll require Nina to have the courage to ask. However we know that Edgeworth is still interested, even if the characters (Edgeworth included) don't. Then she finally does ask in Chapter 14, and I'll let the moment speak for itself. ★ The case is good enough to be featured. Please make the requested changes. Congratulations! I did not think I was going to care for this case at first, but I enjoyed it on subsequent playthroughs. Making me like a dating simulator is an accomplishment. All the non-clerical recommendations I'd make, I've discussed in the various parts of this QA. I can compile those if you'd like, but they all do need to be addressed. If the change can't be done without deviating too much from the source material, or you don't think the change would be good for the story, let me know. I'll give this a final readthrough for typos and miscellaneous presentation errors within two weeks. I need some time before I start, so I can look at this with somewhat fresh eyes. When I post those, fix them, let me know, and I can give you the feature star. I found two or three such typos, but the only one I remember is misspelling "apocalypse" as "apocolypse" in Chapter 7's scene with Franziska. Thank you so much! Don't worry about compiling them: I want to re-read all of your comments anyway, so I'll go through it all and make the necessary changes. Once I have, I'll put together a little summary of changes, so that you can judge whether they are enough. If there's anything I feel I can't change, I'll comment on it there as well. I ran a copy of your script through spellcheck. I don't think anything more extensive is warranted for this case. Again, congratulations! Let me know if you have questions about my feedback or are ready for me to look over revisions. 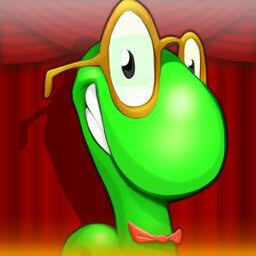 When playing the game, make sure to examine and present whereever you can to get the full experience! When playing the game, make sure to examine and present wherever you can to get the full experience! Well, since I'm finally a prosecutor, I thought I'd try and practise presenting some evidence. Well, since I'm finally a prosecutor, I thought I'd try and practice presenting some evidence. From next week, you will be undertaking your first real trials. Next week, you will be undertaking your first real trials. ...claiming there had been violence and sexual harrassment in the interrogation. ...claiming there had been violence and sexual harassment in the interrogation. You're 9 years too slow to be worthy of rivalling the name of von Karma! You're 9 years too slow to be worthy of rivaling the name of von Karma! In that case I suggest you keep a closer eye on your posessions. In that case I suggest you keep a closer eye on your possessions. Okay, I've started to go through your review to make the changes. I'm just going to address the changes here, but I still have to go through from the "Chapters 8-11" post onwards. I also have a question on chapter 4, so please let me know what you think on that. ->Removed this line to avoid the issue, as it is unimportant. "Not logical" originally imo meant that Edgey simply doesn't like Klavier and doesn't understand why anyone would - however, this may well be out of character as most adults do understand that people have different personalities, people are attracted to different personalities etc. Removed "girls" for this. If he were going to say one or the other, I think he'd probably say women. The original story just used "women" - I only added "girls" on a whim to add to his awkwardness. This is interesting. Maybe this is not quite relevant to what you are saying, but perhaps as a point of interest, "laidback" and "fun-loving" were difficult to translate from the origianl. The original words were "karui" and "nori no ii". "Karui" means "light", but in this sense "lighthearted" also works, or perhaps someone who "doesn't take things too seriously." "nori no ii" is more like, someone who gets into the mood easily - as in, living in the moment and just accepting whatever's happening around them, or not hesitant or embarrassed to join whatever fun thing is happening. Perhaps word choice would help here? Though that doesn't quite solve your issue that this seems unnatural in the first place. Or, perhaps replacing the majority of the taxi conversation with a more subtle inner-monologue would do the trick here? This conversation was, of course, in the original, but I think I would be okay with editing it here, because I get exactly what you mean (I also felt it was a bit off when I read it for the first time). When Gumshoe says Edgeworth is "pretty nice deep down," Nina asks herself "how deep" that would have to be. Perhaps you should clarify that line? Based on Chapter One, Nina does appreciate the time Edgeworth gives her, which was emphasized just at the start of this chapter by Edgeworth's trial preparation before the earthquake hit. Removed this line: this was just a throwaway line for humour's sake, but it does kind of break her character, and admittedly I never thought too much about it when I put it in. (Chapter 5) Out of curiosity, did Larry appear here in the original work? No - just like in the game, it just mentions that she's heard that the brown-haired man who works there is Edgeworth's friend, but that he's not working today. I had to go back to this one. Indeed, the original line is basically: "if you don't give up, you will arrive at the truth". I see what you mean about that. But Edgeworth does say, in 2-4: "It doesn't matter how many underhanded tricks a person uses. The truth will always make itself known." So I don't think it's odd that he would say something similar here since his stance in the games seems to be that the truth will always be found (even if, as you point out, this doesn't quite make sense with DL-6 and everything). I also seem to recall him following a similar belief throughout AAI2, though I may be misremembering. In light of this, do your thoughts change? Because if not for the games, I think I wouldn't mind changing it. As you suggest, I've added in a line to fix your first issue. As for the second, I had a look, and I think the problem was that there is some description of how he's acting (looking at the floor, or looking uncomfortable), which I need to express perhaps in inner monologue, rather than leaving it to the sprites to express, which is what I have initially done. I've had a go, but with a light hand - I'm just a bit wary of editing the scene too much. Please have a look and tell me what you think. Finally: I've been through and fixed all the spelling errors you noted! I think that's it from my end at the moment. Please let me know, in light of my responses, whether you still consider that changes need to be made. In the meantime, thank you so much for spending the time to review the case! You're welcome. It took a bit for me to get into the genre, but by the end, it was truly a pleasure! Responses to your comments. The changes you made to the taxi conversation satisfy me. I personally like the version you have, because seeing Edgeworth flustered is a nice change from his usual coolness. If you think it would be better as inner monologue, then by all means, change away. I had forgotten about that line in 2-4. Between that and the changes you've already made, I'm satisfied. And that's the last thing I have. Decide what you'll do about Chapter 4, let me know when it's done, and I can award this the star. Enthalpy wrote: You're welcome. It took a bit for me to get into the genre, but by the end, it was truly a pleasure! Responses to your comments. I fixed up that space. If you're satisfied with the taxi conversation now, then I think I'll keep it like that to keep it closer to the original. I've made all the changes I want to now. ★ The QA inspection is complete. This case is now featured. Congratulations!